Showing results for tags 'chewy'. Gingersnaps are one of my favorite holiday treats, and one of the treats that I had given up as part of my gluten-free diet. Here's a recipe for delicious soft, chewy, gluten-free gingersnaps that will put a holiday smile on your face and have people begging for more. Ingredients: ¾ cup shortening 1½ cups brown sugar 2 eggs ⅓ cup molasses ⅓ cup white sugar 2 teaspoons apple cider vinegar 2¾ cups gluten-free flour mix 1 teaspoon xanthan gum 1 teaspoon baking soda 1 teaspoon ground ginger 1 teaspoon cinnamon ½ teaspoon ground cloves Directions: Preheat the oven to 350°. Mix the gluten-free flour, xanthan gum, and baking soda together in one bowl. Cream the butter and sugar in another bowl. This works best with an electric mixer. If you are doing it by hand, make sure the butter is soft. Add the eggs, then molasses (Plantation Barbados unsulphured molasses gets high marks, so I use that for this particular recipe), then apple cider vinegar to the creamed butter and sugar. Add the spices, and slowly, stir in the combined dry ingredients until the mixture is just blended. The dough should be somewhat firm, so add more or less flour as needed. I usually bake a test cookie or two to get it just right. Roll the dough into small balls (about one inch). Place them on a greased cookie sheet, and bake for 10 to 12 minutes, depending on your oven. Watch the first batch carefully, to judge how much time to give them. Here's the recipe for my basic gluten-free flour: Gluten-free flour mix: 1 part white rice flour 1 part tapioca starch 1 part cornstarch I find it convenient to mix a large batch ahead of time, and then store it in an airtight container. In the celiac world, there remains a long-standing controversy over whether to exclude oats and oat products from the list of "safe" gluten-free grains. When I was diagnosed with celiac disease, standard protocol recommended against including oats in a gluten-free diet, but more recent studies show that oats themselves are likely not the source of a celiac reaction. Instead, researchers now believe that the fact that milled oats are often contaminated with other gluten-containing grains has skewed diagnostic testing of reactions to gluten from oat products. The most recent scientific statements on the inclusion of a reasonable amount of oats (1 cup or less per day) in a gluten-free diet indicate that most individuals with celiac disease can actually tolerate uncontaminated oats. However, health professionals (including the American Dietetic Association) recommend that newly diagnosed celiac patients avoid oats until the disease is well-controlled with full resolution of symptoms and normal blood tests demonstrate that tissue transglutaminase levels (IgA tTG) are under control. Gastroenterologists also universally caution that introducing oats into your diet should only be done under the guidance of your physician. Federal food labeling laws and rules have incorporated this recent research and have not per se excluded oats from future "gluten-free" labeling, so long as the manufacturer seeking to dub its oat containing product "gluten-free" demonstrates that there is less than 20 parts per million (ppm) of gluten in that product, just as in any other. Thus, it seems the greatest hurdle to reintroducing oats to your gluten-free diet will be the shortage of mills and processing plants which produce certified "gluten-free" oats (and the resulting high cost of those few products)! I decided to try these outrageously expensive "gluten-free" oats myself to expand my baking horizons (of course, I discussed this with my physician first...). I doubt I will be sitting down to a big bowl of oatmeal anytime soon, since I still love my grits and they are probably 1/5 the price of gluten-free oats! However, as it would be challenging to make oatmeal-like cookies with grits, I dove into my $12 box of oats to see what happened. (Granted, as time goes by, companies like Bob's Red Mill are thankfully making gluten-free oats more prolific -- and thus, less expensive -- they will always be more expensive than my grits!) Just as an aside, I recently found a product available (finally) in the United States that would probably make a mean oatmeal cookie for those of you who are unable or unwilling to give the gluten-free oats a try. On one of my European adventures many years ago I thoroughly enjoyed German muesli made with rice flakes, but have since been unsuccessful finding them Stateside. Imagine my surprise when, on a slightly less exciting adventure last week, I discovered them at David's Natural Market in Columbia, Maryland! But back to the oats. I used them quite successfully in the first oatmeal-raisin cookie I have had since 1999, and I'm pleased to share the recipe with any of you who would like to try! The oats I used were Lara's and the rice flake substitute I found at my local organic market was made by Shiloh Farms. The cookies are soft, moist, chewy, full of cinnamon-y flavor and are almost totally gone, so I only had 2 left for a picture! I probably should have doubled the recipe, but my oats were so darn expensive! Oh well, these are worth splurging for next time. I hope you enjoy! ~jules Soft & Chewy Oatmeal Raisin Cookies ½ cup Earth Balance Buttery Sticks or butter ½ cup granulated cane sugar ½ cup firmly packed brown sugar 1 egg + 1 egg white ½ teaspoon gluten-free vanilla extract 1 cup All Purpose Nearly Normal Gluten-Free Flour Mix ½ teaspoon baking soda 1 teaspoon baking powder ¼ teaspoon salt 1 teaspoon cinnamon 1 ½ cups gluten-free oats* ½ cup baking raisins** Cream the sugars and butter until fluffy. Add the eggs one at a time and thoroughly incorporate into the batter. Stir in the vanilla last. In a separate bowl, combine all dry ingredients (except oats), mixing well. Stir into the creamed mixture until integrated. Stir in the oats and raisins. Cover the bowl and chill until cold, at least 2 hours. Preheat oven to 350 F for static ovens or 325 F for convection. Roll the dough into tablespoon-sized balls and place at least 2 inches apart on a parchment-lined cookie sheet. Bake for 8 - 10 minutes, or until lightly brown. If you can wait, let them cool on a wire rack before removing. *Note: Not all people with celiac disease can include oats in their diets. For more information on whether they are appropriate for your diet please see our Celiac Disease and Oats section. **If you do not have baking raisins on hand, gently boil ½ cup of raisins in a saucepan with enough water to cover them. Drain, then add to your recipe. These Chewy Cherry Cocoa Scones will knock your socks off! They're gluten-free and dairy-free and vegan so they're sure to please everyone in your home. Enjoy! Gluten-Free and Vegan Makes 12 Ingredients: 1 ½ cups brown rice flour 1/3 cup tapioca flour 1 Tbsp. baking powder 1 Tbsp. cocoa powder ½ tsp. sea salt ½ cup Earth Balance vegan butter 1 tsp. maple syrup ½ cup almond milk 1 Tbsp. 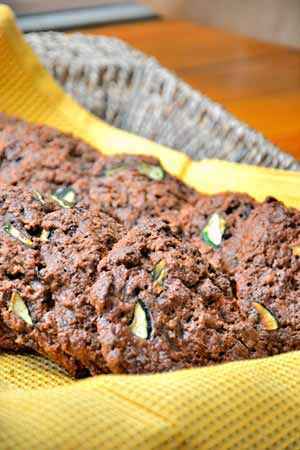 almond extract 1 large zucchini, finely chopped 2 Tbsp. ground chia seeds 1/4 cup gluten-free cereal, crushed 2 Tbsp. dried cherries, finely chopped Directions Preheat oven to 400 degrees F. Place the flours, baking powder, cocoa powder and sea salt into a medium mixing bowl; whisk to combine. Add in vegan butter; continue to mix. In a separate small bowl whisk together maple syrup, milk and almond extract. Add to dry ingredients; mix well with hands until mixture thickens. Add zucchini, chia seeds, crushed cereal and dried cherries; continue to mix. Using a tablespoon, portion out golf ball-sized portions onto a cookie sheet. Bake for 15-20 minutes or until golden brown. Remove from oven; set aside to cool before serving. Enjoy. I’m always keeping an eye out for nutritional snacks that are convenient for “grab-and-go” moments. 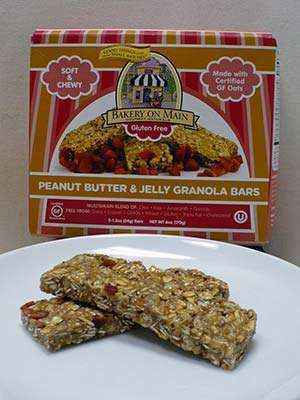 I recently came across Bakery On Main's Gluten-free Peanut Butter and Jelly Granola Bars and I have to say that I was pleasantly surprised. These bars are soft and chewy and are made with real peanut butter and dried strawberries so there are no mystery ingredients or artificial flavors, which always gives me extra peace of mind. 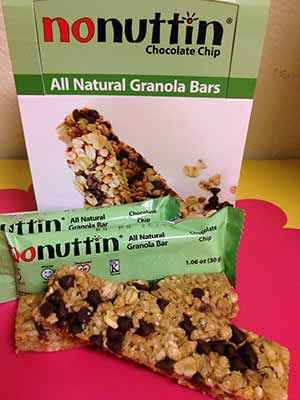 What I did find surprising is that the bars also contained other nutritional gluten-free grains like quinoa and amaranth but my kids still liked them. Visit their site: www.bakeryonmain.com Note:Articles that appearin the "Gluten-Free Food & SpecialtyProduct Companies" section ofthis site are paid advertisements. Formore information about this seeour AdvertisingPage.